The lawmaker who dressed in blackface is pushing an ethics bill today. Does it matter? State Rep. Anthony Sabatini has been been getting his bills through committees despite the controversy. 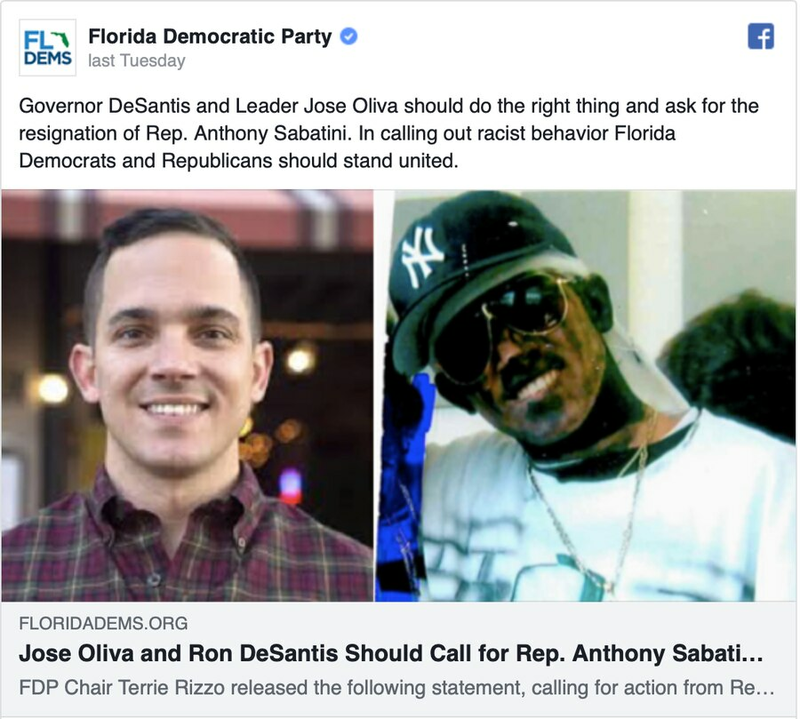 Over the last week, no Florida lawmaker has been more embroiled in controversy than Republican state Rep. Anthony Sabatini, who has been making national headlines for wearing blackface in a grade school prank 14 years ago. It hasn’t stopped him from pushing numerous bills in Tallahassee, though. The latest? A bill about ethics. Later today, the freshman from Howey-in-the-Hills will be advocating for a sweeping bill that would mostly strengthen the state’s ethics laws. And if the past week is any guide, Democrats will put up little resistance. Democratic Party Chairwoman Terrie Rizzo has called for him to resign amid a national debate about the use of blackface, the deeply racist practice historically used to caricature black people. Governor Ron DeSantis’ first choice for Secretary of State, Mike Ertel, resigned last month after a photo surfaced of him dressing up as a Hurricane Katrina victim. But the top Democrat in the House, Minority Leader Kionne McGhee, has been silent on the issue, and Sabatini has been presenting other, far more controversial bills without the issue coming up. The bill he’s bringing up today is HB 1, and it’s mostly a repeat of a bill pushed last year by the House’s Public Integrity and Ethics Committee. It does not yet have a Senate sponsor. It’s a large, complicated mix of proposals that would mostly toughen the state’s ethics laws. It includes provisions that would ban officials from getting investment advice from lobbyists, require lobbyists who lobby the executive branch to register online and make it illegal for officials to seek jobs that conflict with their lawmaking duties. The commission’s analysis also found that Sabatini’s bill is so extensive that it would cost the organization about $136,000 to hire another lawyer and investigator. “The fiscal impact is substantial, as this bill creates a number of new standards of conduct for public officers and employees, and new and complex provisions, often with equally complex exceptions,” the commission’s analysis states. The House Public Integrity and Ethics Committee is scheduled to have a workshop on the bill this afternoon. Jacksonville state Rep. Tracie Davis, the ranking Democrat on the committee, said she hadn’t yet read the bill. The allegations against Sabatini are not new. They surfaced in October, in the final weeks of Sabatini’s campaign, but resurfaced recently over the discussion over blackface. Sabatini, now 30, was 16 when he dressed up as his high school friend Brandon Evans, who also dressed up as Sabatini. Evans told the Orlando Sentinel and the Washington Post that he didn’t believe it was racist. Amid the controversy, Republican House Speaker José Oliva issued a statement noting that voters elected Sabatini with knowledge of the incident. Sabatini has been presenting bills on school board member term limits, red light cameras and banning bans on plastic straws without it coming up. She said she’s been talking to Sabatini and understands that he was young when it happened, but feels he should still apologize. “I think it’s courageous to say, ‘I made a mistake and I’ll do better,’” she said. Sabatini he initially felt terrible for anyone who saw the photo and didn’t understand the context. But as the story grew and as he explained the context to reporters, he felt that some news reports were using the incident to be sensational, and he’s since refused to apologize. “Nobody who understands the full context should possibly expect an apology,” he said. “Anyone who thinks it’s racist is either completely insane or is just looking for clickbait headlines."